According to the National Offshore Wind Strategy Report published by the U.S. Department of Energy (DOE) and the U.S. Department of the Interior (DOI) in September of this year, offshore wind potential is almost double the nation’s current electricity consumption. With almost 80% of the electricity demand in the United States located in coastal states, “offshore wind has the potential to contribute significantly to a clean, affordable, and secure national energy mix.” While we have already outlined some of the financial, manufacturing, regulatory, and policy factors at play in offshore wind development, there are also a number of environmental and wildlife interests to consider. There are some positive environmental externalities that are universal enough to be recognized across this field. Like terrestrial wind, offshore wind is carbon-free, a clean fuel alternative that will continue to help the nation wean off fossil fuels and lower our impacts on climate change. The National Offshore Wind Strategy Report indicated that offshore wind could provide a “1.8% reduction in cumulative GHG emissions (1,600 million tonnes of carbon dioxide equivalents) through 2050, saving $50 billion in associated global damages.” Wind energy is also significantly less water intensive than other alternatives, such as nuclear, helping reduce unnecessary water consumption. Furthermore, the quicker, shorter transmission from the turbines to the coastal load center will help reduce energy loss and create a more efficient system. 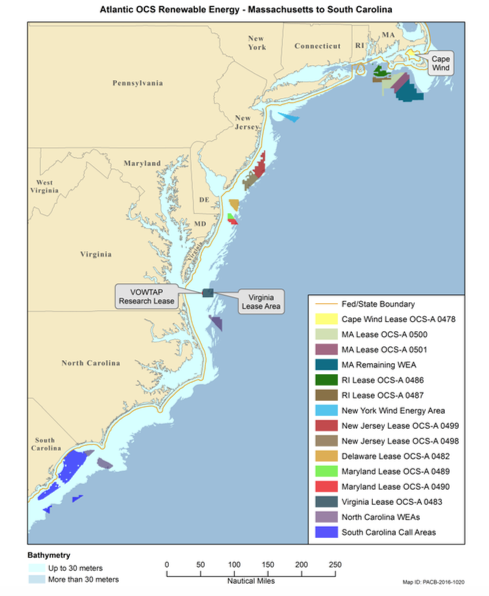 Because the first offshore wind farm just started generating energy last month, and there are currently 11 other active commercial leases in the Atlantic Ocean, we focused the rest of our research efforts on the Eastern U.S. seaboard. 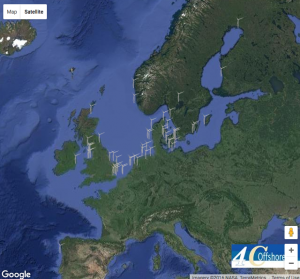 Though DOE and DOI notes that hundreds of environmental studies have been taken place at offshore wind farms in Europe, there are few official assessments that have been conducted from the U.S. coast. Pursuant with the National Environmental Policy Act (NEPA), environmental assessments are only conducted once there is an intent for a federal action with potential significant environmental impacts to occur. The assessment then determines the need for an Environmental Impact Statement (EIS), a much more detailed report that would give us the kind of information we’re looking for. In other words, because offshore wind in the U.S. is such a new business venture, there was no previous need to do this research. Source: Biodiversity Research Institute. Persistent species richness hotspots—areas with consistently greater numbers of species across all surveys. Environmental stressors such as noise concerns, habitat loss, and disruption of migration patterns have all been evaluated at sites across Europe. 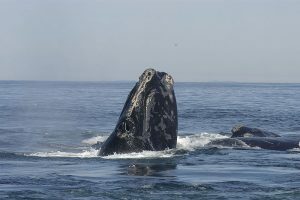 According to the National Wildlife Federation, the American Wind Energy Association, and the American Wind Wildlife Institute, several of these studies have found that offshore wind has fewer long-term impacts on wildlife than other energy sources. Luckily, there are also some similarities in wildlife distribution that we can observe between Europe and the Eastern U.S. to being extrapolating potential externalities. For instance, the red-throated loon, which resides in both locations, has experienced significant habitat loss and displacement and is now considered a vulnerable species. The common scoter, on the other hand, experienced temporary loss of habitat and feeding grounds, but this bird has since rebounded and returned to roost in the wind farm areas. However, there are more differences than similarities that need to be considered. For one thing, U.S. offshore wind permits are all for locations farther offshore, due to higher wind speeds and a larger resource base. Similarly, the Mid-Atlantic Ecological Baseline Study found several other potential environmental issues specific to Atlantic wind projects. Looking at 13,000 km2 of ocean space, including the Virginia, Maryland and Delaware coasts, this study analyzed which marine species and flora might be negatively impacted by offshore wind development. Creatures like sea turtles, the north atlantic right whale, and several other bird species could all potentially face migration and habitat disruption from offshore wind construction. Ultimately, more site-specific studies and evaluation of potential measures are needed to avoid and minimize environmental risks. As offshore wind energy continues to develop in the U.S., there will be an increasing need is an increasing need for environmental impact assessments and studies. 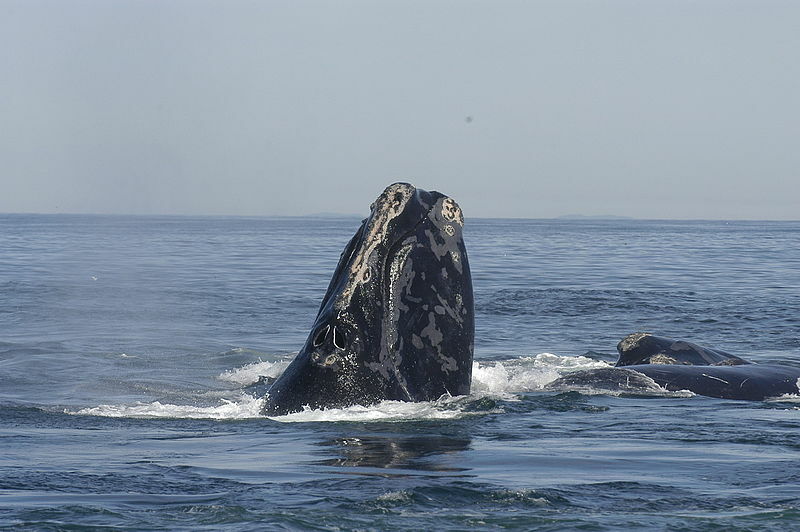 According to the DOE, “some impact assumptions are founded in predictive information rather than in empirical research.” Vulnerable species and ecosystems will need to be protected and considered as offshore wind energy grows and expands. American Wind Wildlife Institute (AWWI). 2016. Wind turbine interactions with wildlife and their habitats: a summary of research results and priority questions. Retrieved from https://awwi.org/resources/summary-of-wind-wildlife-interactions-2/. Biodiversity Research Institute. (2015). Mid-Atlantic Ecological Baseline Study. Retrieved from http://www.briloon.org/mabs. U.S. Department of Energy and U.S. Department of the Interior. (2016). National Offshore Wind Strategy. Retrieved from https://www.boem.gov/National-Offshore-Wind-Strategy/. U.S. Environmental Protection Agency. (Updated July 2016). National Environmental Policy Act Review Process. Retrieved from https://www.epa.gov/nepa/national-environmental-policy-act-review-process. With the impacts of conventional power generation being seen around the world in the form of pollution and climate change, many countries are trying to increase the amount of power they generate from renewable sources. Offshore wind power generation projects have been very successful as a form of renewable energy in Europe and some parts of Asia so why have they yet to gain traction in the United States? Perhaps the biggest obstacle in the implementation of offshore wind power generation projects is the cost. The financing of renewable energy ventures such as wind and solar farms is very different from conventional power projects due to significantly higher capital costs and lower operating costs as a result of not needing to supply fuel. 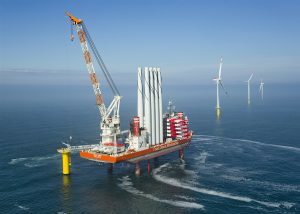 Offshore wind generation is at this time particularly expensive and risky due to its development being in its infancy. 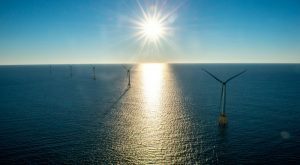 There is only one commercial offshore wind farm in the United States, Block Island Wind Farm in Rhode Island, and it is set to begin operating later this month. The project cost $290 million to construct and consists of just five wind turbines, far too few to make the facility profitable in the near future . Although offshore wind farms are more expensive to both install and maintain than onshore facilities, putting turbines in the water has some advantages. First, the most populated areas of the United States are along the coast, so generating power nearby decreases the cost of energy transport. In addition, high wind speeds offshore are both more consistent and occur at peak energy times compared to onshore wind. Although offshore wind technology is currently very expensive, onshore wind farms were also expensive in their beginnings. In the past six years, the cost of onshore wind generated electricity has dropped by 66% . These statistics indicate that with the same level of commitment and financial support, constructing offshore wind facilities will too become more affordable. The United States government is involved with helping develop offshore wind energy generation through various departments and legislation. The US Department of Energy (DOE) has a goal to generate 20% of US energy from wind power by 2030, up from the 4.7% generated in 2015, and they see offshore wind farms as the key to achieving this goal . Since 2006 the DOE has invested over $300 million in offshore wind generation research and pilot projects, including Windfloat Pacific, a floating offshore wind farm in Oregon set to be commissioned in 2017 . Clean Renewable Energy Bonds (CREBs) are available from the US government to non-taxable entities including state and local governments, rural electric cooperations, Native American tribal governments, and public and private non-profit organizations. A CREB holder receives tax credits from the federal government as an alternative to paying a portion of the bond interest. Though CREBs are a great way to make large renewable energy projects more affordable, funding is scarce and the program does not have enough money to distribute CREBs to all the entities that apply for them . Although government support and assistance will help the offshore wind energy industry develop, it will not be enough to get it off the ground and profitable. The cooperate and public sectors will be essential to the success of the industry. The onshore wind energy industry in the United States relies heavily on project financing, a loan structure where investments are based on a project’s risks and future cash flow and the cash flow of the project is used as repayment to investors. Project financing is a limited-recourse type of financing where creditors have recourse only to the assets and cash flows of a specific project, protecting the project company in the event of failure but also allowing investors to maximize equity returns . The main investors in the US wind industry are both domestic and international banks, energy companies, private investors, and cooperations. Many wind farms, including Block Island are funded by a combination of investors. Block Island’s funding came from Mandated Lead Arrangers Societe Generale of Paris, France, and KeyBank National Association of Cleveland, Ohio as well as the company developing it, Deepwater Wind, through equity investments from the company’s owners . Due to US population centers being located along the coasts and the high and constant wind speeds at sea, I believe that offshore wind energy is important in the future of US renewables. However, the industry needs to be catalyzed either by large investors starting up the market or government regulations and policies being put in place. Large investments in offshore wind would drive down the development costs and improve technology, making wind farms more affordable to implement. Increased requirements for renewable power generation would force coastal areas to look to the ocean to harvest energy. These regulations would be beneficial implemented at the federal, state, or local level. Although offshore wind projects have high capital costs, there are funding options available that make investing in the future of renewable energy worth it. So far we’ve discussed policy and government standards that play important roles in the development of offshore wind in the United States, but we have yet to cover the practical process, benefits and barriers. Indeed, one of the biggest barriers to offshore wind development that has rarely been focused on, as identified by last year’s Bass Connections Offshore Wind Energy group in their final report, “The dynamics of offshore wind perception and acceptance across development models” is social acceptance of offshore wind turbines . 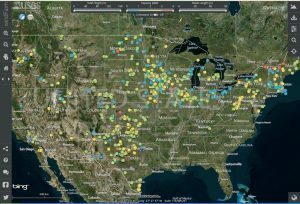 It is largely because offshore wind energy is still so new in the United State; few people know about it and know what to say so few offshore wind farms have been implemented in the United States- one, to be exact . However, as we look towards using more renewable energy, offshore wind ought to stand out as one of the clear sources of the future. One key towards actualizing this is greater public knowledge of what offshore wind actually entails, beyond the intangibles of regulation, leasing, government credits, etc. and into the physical presence of turbines. We begin by asking: why, practically, haven’t offshore wind farms sprung up in the United States as they have all over Europe? Europe has upwards of 11000 MW of power generated from offshore wind compared to our soon-to-be 30 MW from the one currently existing farm in Block Island. Well, if we look beyond purely policy, as well as the differing environmental conditions, we find that onshore wind has just been more successful in the United States, which actually leads the world in wind energy production at about 190 million MWh produced in 2015 . In the same period that Europe increased its offshore wind production capacity after the installation of the first turbines in Denmark in 1991 to about 11 GW, the United States has increased its wind production to about 75 GW, all of which is onshore . I spoke to an R & D manager of offshore wind development projects at GE/Alstom to figure out why, and also to ask a bunch of other questions about this energy sector. The practicality of it plays a much bigger role than I imagined- and it shows that perhaps, the lack of offshore wind development may not even necessarily be a “problem.” Essentially, the United States has had a lot more success on land just because there is land to go around. Looking at Europe, there’s a dense population and little space for expansive onshore wind farms to be installed that would satiate the continent’s energy needs. So, these countries looked to the ocean . Meanwhile in the United States, there is a lot of open land with solid wind in the middle of the county, and onshore wind farms are definitely easier and cheaper to install and operate. So if we have awesome onshore wind production, why should we even bother moving into the oceans? This, too, was answered by my phone call with GE/Alstom. Again, more practical reasons. The transmission capacity is saturated from the Midwest to the coast, which is unfortunate because the majority of the United States population lives along the coasts and that’s only expected to increase over time . States like Massachusetts, Virginia, California, North Carolina, Maryland- these all have dense populations with high energy needs, but not a whole lot of renewable energy from wind bring produced. And this is where we look to the ocean. It’s beneficial for these states closer to the ocean and it’s beneficial for mitigating transmission challenges. In addition, offshore wind is better aligned with the demand profile, providing stronger winds and better production during the late afternoon times when energy demand reaches a peak during each day. It’s also less variable than onshore wind. Good enough reason that we can’t not pursue offshore wind- in fact so good that offshore winds in the United States are projected to “produce a total energy generation of up to 30 percent more than U.S. onshore winds,” . And also, to answer the initial question- well, since we have this strength in the onshore wind industry, it should only aid us in our move towards offshore wind development. Assuming we are successful in garnering a lease, jumping through all the hoops of government regulation, and financing our project, how do we actually get a wind farm started in the ocean in the United States? Good news: if we have all of the above done, it actually isn’t too difficult. But there are still a number of things that need to happen. The developer, which may be a European company interested in investing in offshore wind in the United States such as Dong Energy, or an American company such as Deepwater Wind (currently the developer behind the United State’s first offshore wind farm at Block Island), will be the stakeholder who has acquired the lease, gotten permits, and found upfront investment for initial costs. Their next step is to do business with the suppliers, i.e. enter into a turbine supply contract. Suppliers are companies like GE or Siemens who will provide the turbines and engineering services for the physical construction of wind farms. A description of these engineering services includes the entire turbine design process, which considers the major environmental conditions that affect offshore turbines: wind (and not just speed, but also direction and turbulence), wave, seabed, weather (such as hurricanes), and anything else that may affect structural loading and turbine stability and function over its lifetime- not just during installment. It is a long process due to the different conditions in the United States: everything prior has been designed for use in Europe, and of course, one cannot just take what was successful there and transplant it here. And everything is still manufactured in Europe: the blades, the towers, the nacelles, the big parts and the little parts that form the turbine. They must be shipped to the United States on large vessels, along with the installation vessels, which cost hundreds of thousands of dollars per day to operate. I was concerned about how long the installation process would take, what with driving in the foundation for these things and putting them in action in the middle of the ocean. But apparently, that itself is quite streamlined, taking only about 4 weeks in the case of Block Island (and even that was lengthened due to poor weather conditions). The only caveat for smooth installation: this period must be planned two years in advance because of booking these installation vessels, like the Fred Olsen Windcarrier. These practicalities of the process can’t come into play, however, unless we pass the initial cost barriers. The perception of risk that surrounds offshore wind only bolsters these cost barriers, a perception that must be destroyed if we truly are committed to creating a shift to renewable energy, and a perception that can only be destroyed with greater clarity and public awareness of offshore wind energy. McAuliffe, Emily, Ori Sharon, and Molly Rosenstein. “The dynamics of offshore wind perception and acceptance across development models.” 2016. Fehrenbacher, Katie. “This Is Where the First U.S. Offshore Wind Turbines Were Just Installed.” Fortune, Fortune, 8 Aug. 2016. “U.S. number one in the world in wind energy production.” American Wind Energy Association, edited by David Ward, AWEA, 29 Feb. 2016. “Wind Energy Regions: Denmark.” South Baltic Programme, Rostock Business and Technology Development. GE/Alstom. Telephone interview. 18 Oct. 2016. “What percentage of the American population lives near the coast?.” National Ocean Service, National Ocean Service. Todd, Jennifer, Jess Chen, and Frankie Clogston. 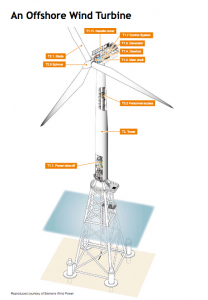 Analysis of the Offshore Wind Energy Industry. International Economic Development Council, 2013. In 2005, the Energy Policy Act (EPAct) gave the Secretary of the Interior, and thus the Bureau of Ocean Energy Management (BOEM), the authority to issue leases for developing renewable energy projects on the Outer Continental Shelf (OCS). BOEM has to comply with several stipulations when overseeing projects on the OCS; projects must be developed in environmentally responsible ways, must consider other uses of the OCS, and BOEM must coordinate with relevant federal agencies and state and local governments. Taking these things into account, the regulations for the Outer Continental Shelf Renewable Energy Program were finalized in 2009, and provide a framework for permitting activities on the OCS pertaining to energy from renewable sources. Offshore wind energy, ocean wave energy, and ocean current energy are of particular interest to BOEM. As climate change becomes more of a topic of interest and as the world begins to explore more options in renewable energy, offshore wind energy seems like a promising option; wind turbines have been installed offshore in several European countries. In the United States, offshore wind has the potential of producing over 4,000 gigawatts of energy. So why haven’t we seen wind farms popping up along our coasts since 2009? Part of the issue lies in the complexities, rigidity, and length of the regulatory process. 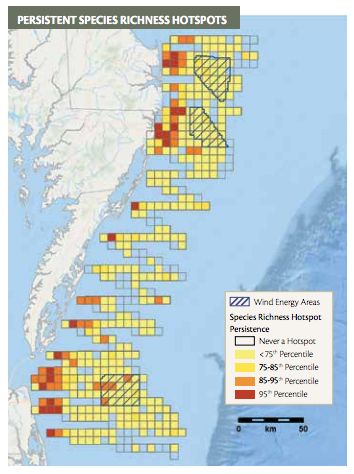 Areas BOEM has identified for offshore renewable energy, including Wind Energy Areas (WEAs). 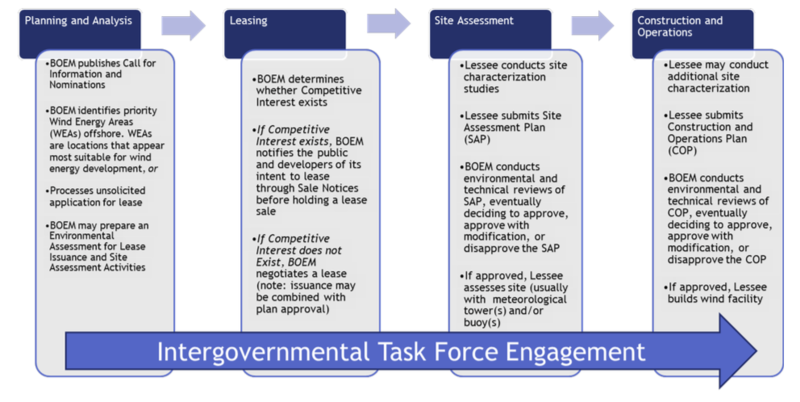 Currently, BOEM utilizes a four-phase process in authorizing offshore wind development including the planning phase, leasing phase, site assessment phase, and construction and operations phase. The process begins when a state expresses interest in developing offshore wind energy resources, and includes the establishment of an Intergovernmental Renewable Energy Task Force made of stakeholders (Tribes, States, natural resource agencies, and government entities) who are involved throughout the process. During the planning phase, BOEM conducts environmental compliance reviews and consults with stakeholders to analyze the potential for wind energy. If it seems like a viable option, then a lease is issued so that the state can begin planning site assessment. No one can build anything yet, but they may collect data for up to five years and complete an environmental assessment for survey work. Then a site assessment plan (SAP) is submitted. For an offshore wind farm, an environmental impact statement must be completed at this stage; this could take eighteen months to two years and requires more consultations. Once the SAP is approved, the developer can begin actually assessing the site for the potential to support an offshore wind farm. Finally, after assessing the site, a construction and operation plan (COP) is submitted that details plans for building and operating the wind energy project. BOEM’s regulatory process for renewable energy on the OCS. The National Offshore Wind Strategy published by the Department of Energy and Department of the Interior in 2016 outlined the benefits of offshore wind in the United States and three themes describing ways to facilitate development of the offshore wind industry. One of these strategic themes is “Supporting Effective Stewardship,” which includes ensuring that the regulatory process is efficient, consistent, and clear. It is clear that the leasing process involves many steps and can take a great deal of time to progress from start to finish. The process also involves several agencies aside from BOEM (the Army Corps of Engineers, US Coast Guard, NOAA, etc), many of which have their own applications to be completed. While it may seem like an easy fix to have a “one stop shop” for permitting and leasing like European countries have, this would be difficult to enact in the United States since all agencies are defined and governed by different laws and mandates. 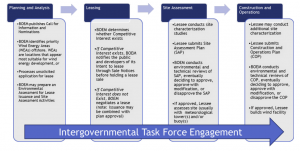 However, to improve communication, steps are being taken to make the plan-review process more transparent and make it easier to align the several agencies involved, even at different levels of government. BOEM has plans to use Title 41 of the Fixing America’s Surface Transportation Act, which requires the facilitating of a major infrastructure project to establish and publicly track the plan for coordination purposes of federal authorizations and environmental reviews. This will be used to track COP reviews. Perhaps the second most important aspect of the process that would make offshore wind a more viable industry in the United States would be to allow for some flexibility in the process. If technology changes or a plan is not reviewed in time, a developer must start back at the beginning of the process. If there were a way to be more flexible given changing technologies, maybe fewer developers would shy away from implementing offshore wind. Wind Energy Commercial Leasing Process [Fact Sheet]. As the quest for energy diversification and lower greenhouse gas emissions persists, renewable sources continue to make up an increasingly larger portion of American energy. Although still in its infancy, offshore wind’s proximity to large demand centers in coastal populations and technical potential for sizeable energy production make it a renewable energy source I believe Americans should continue to pursue. While the DOE and DOI suggest offshore wind has a resource capacity of nearly 2,058 GW with current technology alone, high capital costs and a long, complex permitting process diminish incentive to pursue it (Energy and Interior). After acknowledging these barriers, offshore wind’s implementation is reliant upon proper incentives that encourage the source’s energy generation and distribution. Some incentives are financial like investment tax credits issued by Congress or project grants from the Department of Energy. Others are legislative requirements like state renewable portfolio standards. When thinking about today’s political climate and environmental legislation, I believe state renewable portfolio standards are offshore wind’s strongest and most affective incentive to become relevant and prevalent in the electricity generation market. Renewable portfolio standards are mandates created by a state that require a set amount of a state’s electricity must come from renewable sources. Varying from state to state in amounts and timelines, these standards specifically require a state’s utilities (either investor owned or electric cooperatives) to sell a specified amount of their electricity from renewable sources (Durkay). 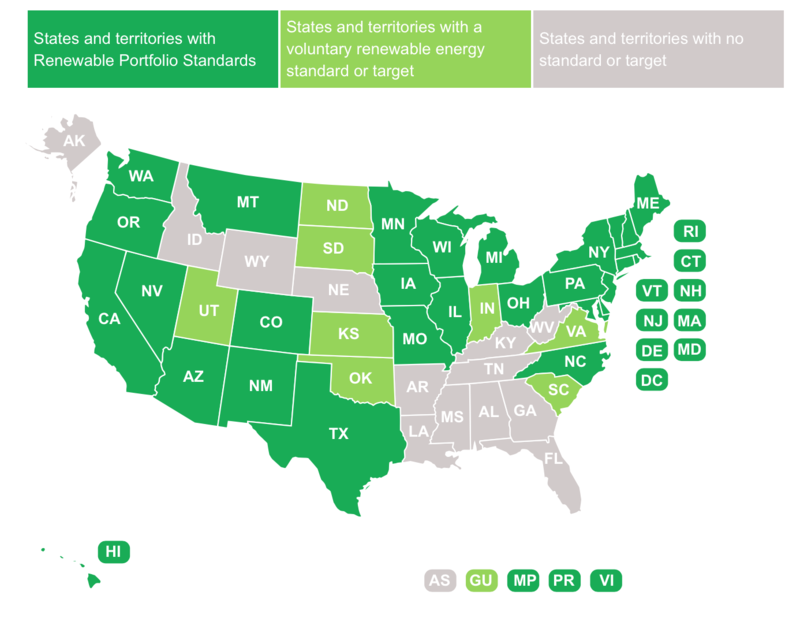 29 states currently have renewable portfolio standards, which are required, and eight states have renewable portfolio goals, which are voluntary. Iowa was the first state to mandate a renewable portfolio standard in 1983 under the Alternative Energy Law (Durkay). Through these requirements, renewable portfolio standards provide incentives for investors and electricity producers to pursue a market that was otherwise considered expensive and costly. Under a renewable portfolio standard, a state has the freedom to determine how much of their electricity they want to come from renewable sources, how long it will take to fulfill this requirement, and even which sources they may want to favor. While they all require the implementation of renewable sources for electricity generation, certain states are far more ambitious in their renewable standards than others. Pennsylvania’s Alternative Energy Portfolio Standard requires a meager 18% of electricity sold come from renewable sources by 2021, while Hawaii has ambitiously declared 100% of electricity sold must come from renewable sources by 2045 (Durkay). Aside from ambition and dedication to renewable energy, a state’s commitment to a specific renewable energy source like offshore wind can create further incentive to develop a new energy market. Certain states have specific “credit multipliers” or “carve outs” regarding certain sources of energy that meet the state’s standard. While a credit multiplier allows for a specified source of energy to count more towards the standard than other sources, a carve out designates a certain amount of energy overall must come from one specified energy source. A leader in this field, New Jersey was the first state to create a carve out for a renewable energy source under their RPS with solar energy in 2001 (“New Jersey’s Clean Energy Program”). Since 2001, New Jersey is currently one of three states to have greater than 1 GW of solar installed capacity within their state (“New Jersey’s Clean Energy Program”). After solar’s success under an RPS carve out, the Offshore Wind Economic Development Act was signed into law in 2010, requiring the production of 1100MW of offshore wind electrical generation by 2020. Following their lead, neighboring state Maryland enacted the Maryland Offshore Energy Act in 2013, requiring 2.5% of electricity generated from renewable energy sources must come from offshore wind (Public Service Commission). While generally less ambitious than say Hawaii or California overall, I believe Maryland and New Jersey’s specifications towards offshore wind aide a growing industry by further mandating and incentivizing the energy source within the state RPS. There are currently eleven active commercial leases for new offshore wind sites, four of which are in New Jersey (2) and Maryland (2) (Energy and Interior). Considering our President-elect’s rather unfortunate conservative approaches to issues regarding the environment and subsequently renewable energy, it is safe to assume that productive incentives involving offshore wind will originate from no higher than the state level. Under a state RPS, the state government produces financial and legislative incentives to encourage the generation of renewable energy resources. When we focus on a young renewable energy market like offshore wind, I believe states should institute more financial incentives within their standards to provide monetary aid in fulfilling RPS requirements. In order for offshore wind to be successful, I believe the source needs its own specific requirements (carve outs) or tax credits (credit multipliers) within a state RPS to further encourage producers to pursue offshore wind instead of other alternative renewable energy sources. Durkay, Jocelyn. “State Renewable Portfolio Standards and Goals.” National Conference of State Legislatures. N.p., 2016. Web. 10 Oct. 2016. Energy, U.S Department of, and U.S. Department of the Interior. National Offshore Wind Strategy. N.p., 2016. Print. Harvey, Chelsea. “Massachusetts Just Gave a Huge Boost to the Offshore Wind Industry.” Washington Post 2016. Web. “New Jersey’s Clean Energy Program.” N.p., 2016. Web. Public Service Commission. “Maryland Offshore Wind Energy RFP.” N.p., 2016. Web. November 10, 2016 Lori Bennear, Ph.D.